‘Once upon a time, the beautiful princess Amethyst fell in love with a simple dragon armor smith, but her parents were against their love and expelled the young man from the royal lands. Then the girl turned into an Amethyst Dragon and flew away to follow her love, leaving her father's home' - this is the legend of the appearance of Amethyst Dragons. No one knows if it is true or not, but those that live on the Flying Islands wear pendants with a picture of Amethyst Dragons as a symbol of love. How to Breed Amethyst Dragon? 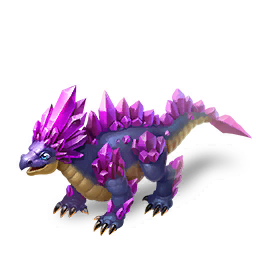 Find out how to breed Amethyst dragon with the How to Breed Calculator!